Getting shots to the net is one thing. Getting shots past a goalie is another, one that the Minnesota Wild failed to do over the weekend. Despite outshooting Buffalo 39-29 Saturday night and Chicago 40-28 on Sunday, Minnesota dropped 3-2 and 3-1 decisions for their first back-to-back regulation losses this season. It’s a trend the Wild want to stop on Wednesday night when they host the Ottawa Senators at Xcel Energy Center in St. Paul, Minn. The loss at Chicago was particularly frustrating. Not only have the Blackhawks been skidding for about a month, the Wild (12-7-2) pumped 29 shots on Corey Crawford in the last two periods. But Crawford, who appears to have retained almost all of his peak value after missing most of last season with concussion-related issues, turned away 28 of them to keep Minnesota at arm’s length. “Getting in front of the goalie rather than the side. 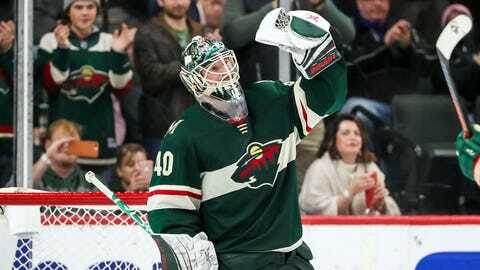 You’re looking for tips,” Wild coach Bruce Boudreau said when asked what his team could have done differently. “Sometimes, it’s tough because we shoot high and when you shoot high if you’re the forward, you don’t really want to go to the front of the net. At the top of the Central Division, there is little room for error. With Nashville off to a 15-5-1 start and a five-point lead, Minnesota can’t afford to eat too many losses in a row. Winnipeg also has 26 points and two games in hand. The way forward Zach Parise sees it, the Wild have to come out with a sense of urgency. The arrival of Ottawa (9-9-3) in town may be what Minnesota needs to get back into the win column. The Senators imploded defensively Monday night in a 7-5 home loss to Florida, playing poorly in front of goalie Craig Anderson. He was chased in the second period after allowing six goals on 22 shots. Ottawa was able to pull within 6-5 and had a 5-on-3 power play for 21 seconds, but couldn’t convert. This will be the start of a four-game road trip for the Senators, who have to figure out a way to shore up the NHL’s worst defense if they are to mount any kind of a playoff push in the Eastern Conference. Anderson has faced more shots than any goalie in the league.